I’m the girl who usually shows up with salad. Well, to be fair, I’m usually the gal who is hosting the event because I love nothing more than channeling my inner Martha and sharing food and drinks with friends. It’s why our tiny dining room has a giant 9-foot farm table in the center of it. Come over and let me feed you! But, if I’m going somewhere, then I’m probably bringing a salad. Why? Besides enjoying the cliche that a dietitian is bringing a vegetable, I love showing off said veggies in a super yummy way. 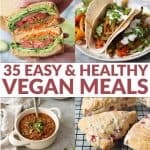 I’ve got an agenda; my mission is to encourage everyone to eat more plants. It’s why I started this website in the first place and what I hope you get when you visit here. A reason to fill our plates with more vegetables. A celebration of how delicious healthy food can be, without it ever feeling like a diet or a punishment. 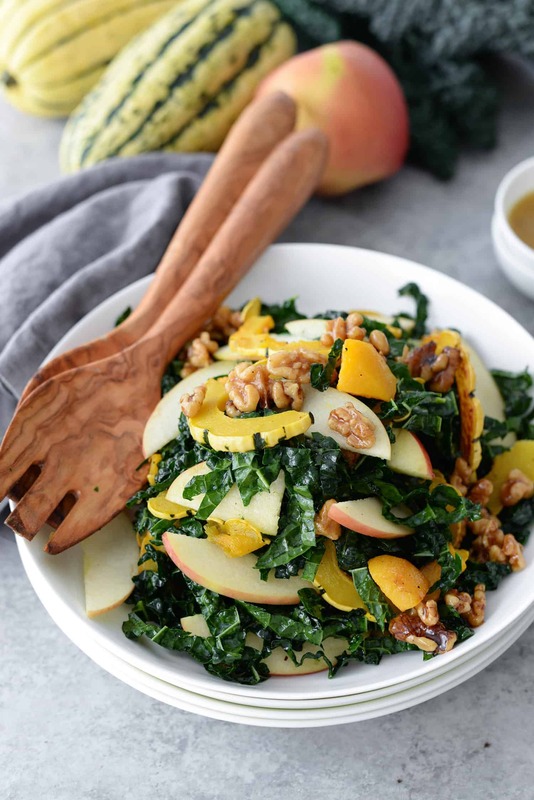 This kale salad is everything you want in a holiday salad. It’s gorgeous (those colors! ), a delicious blend of creamy squash, crisp apple and crunchy nuts and packed with flavor. It’s also a great conversation starter, since delicata squash still tends to be a darling among food bloggers, Trader Joe’s shoppers, farmer’s market foodies… and that’s about it. So roast some squash, then tell everyone how you did it while they are ooing and ahhing over your dish. Slice the delicata in half, then scoop out the seeds. For this salad, I’m really big on how the texture of all the ingredients comes together, so try and slice the squash as thinly as you can. If you have a mandolin (the best $40 you’ll spend), it makes this process cake. If not, just use a sharp knife and try to make them as uniform as possible for even cooking times. Remember how I buy pre-cubed bags of butternut squash like they are going out of season? I threw some of those on the roasting pan along with my delicata squash. You can do this too or you can skip this, completely up to how you want to present this salad. I pinkie-promise you if you try kale this way, you will love it. My sweet husband cannot stand kale, but eats it everytime I make it this way. 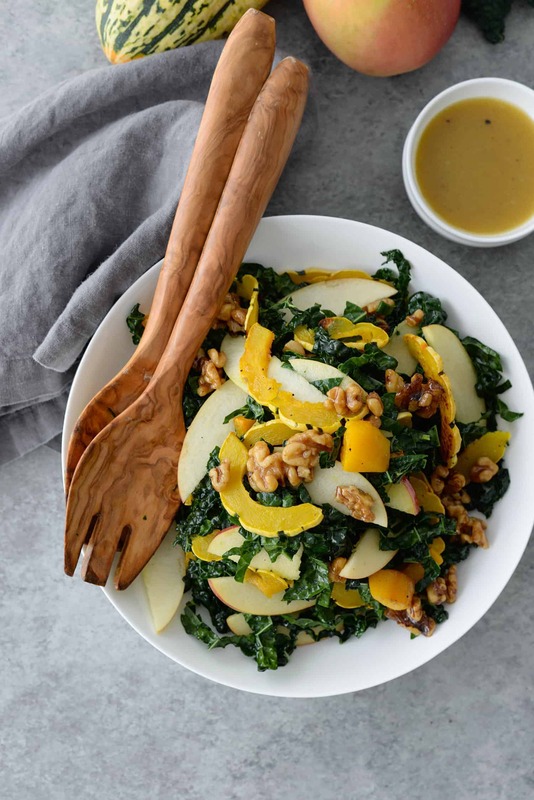 The ribbons almost melt into the salad dressing and remove any bitter flavor that you may think kale has. Promise me on this one. Remove the tough center stems, then roll the kale like you were rolling a cigar (Um, I’ve never rolled a cigar but I imagine it’s similar.) Then, thinly slice from one end to create thin ribbons. Pretend you are chiffonad-ing a bigger bunch of herbs– it’s exactly like that. Then, right before serving, add a tablespoon or two of the dressing into the kale and massage with your hands. This helps to break down the cell walls, creating a tender green. I’m sure you could do this with tongs, but I find your hands to be 1000x more efficient. 2. Just like the squash, the apples should be very thin. This is a salad where texture matters, and you don’t want a giant hunk of apple that you have to chew through. I used my mandolin again to get them almost paper thin, but a knife works. Slice them right before serving so they don’t brown. 3. I don’t understand why someone would go through all the trouble to make a salad like this one and then rely on store-bought dressing. I don’t understand store-bought dressing. 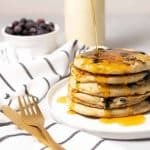 I’ve rarely come across one that I like better than even a simple olive oil and vinegar homemade version, and they are so expensive for what you get. This maple dressing is a riff of my classic dressing that I make all the time, a combination of garlic, dijon, acid and good olive oil. It’s practically fool-proof, just make sure you are adding enough salt. Don’t be afraid of salt! It’s what sets meh salads apart from really good salads. Plus, there is enough potassium in here to balance everything out. I don’t worry about salt. 4. If you do plan on bringing this to a gathering, here’s how I would suggest doing so. Shred the kale leaves, wrap in a barely damp paper towel and place in a ziploc bag. Roast the squash and bring in a container. Make the dressing in a mason jar and bring that too. Bring the apples whole. Make the walnuts and bring those separately. Then, dress and toss right before serving, adding the apples as a final step. 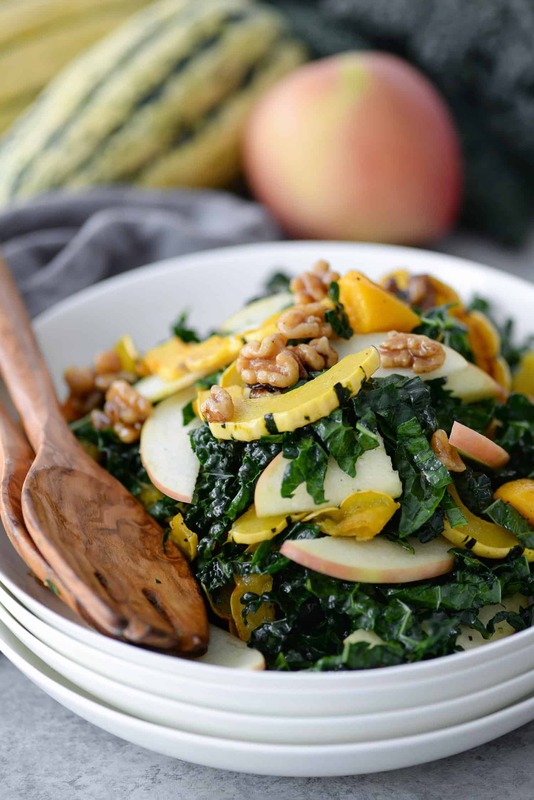 Autumn Squash, Kale and Apple Salad. You’ve gotta try this Thanksgiving or Holiday salad! 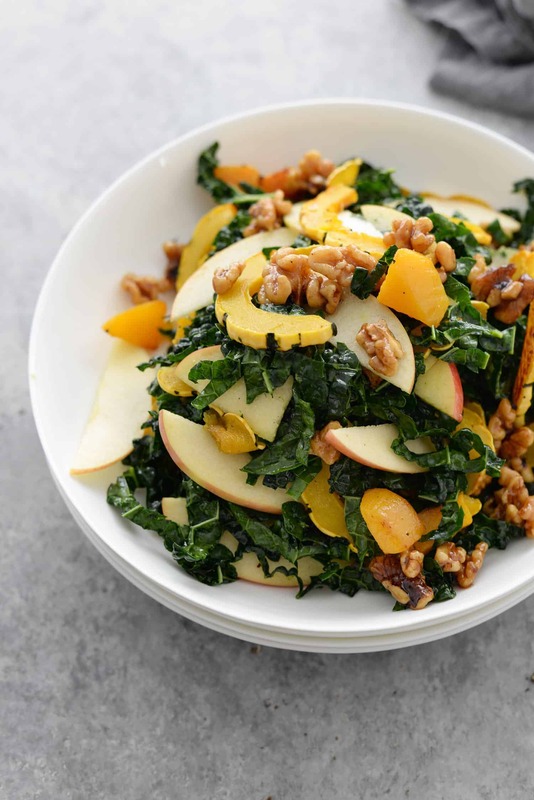 Kale, roasted squash, apple and candied walnuts in a maple-cinnamon dressing. 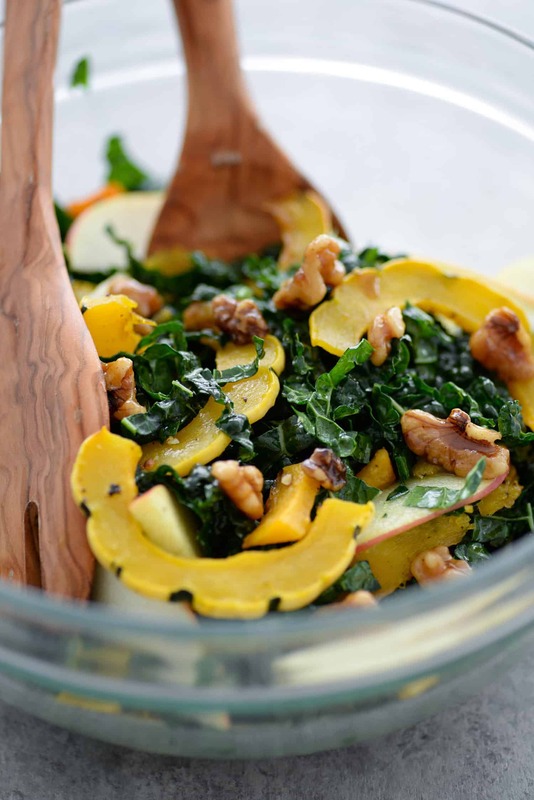 Preheat oven to 400 degrees F. Toss squashes with 1 tablespoon oil oil and pinch salt and pepper. Place on a single layer on a baking sheet and roast until tender, about 25 minutes, flipping once during cooking. Heat the walnuts in a nonstick skillet over low heat, stirring often until just toasted. Stir in the maple syrup, cinnamon and nutmeg. Let the maple syrup bubble up around the walnuts, then transfer to a piece of parchment paper to let cool completely. While the squash is cooking, cut the kale. Remove the tough center rib and stack the leaves. Tightly roll and slice from the end, creating thin strips. Place in a large bowl and set aside. Right before serving, massage 1-2 tablespoons of the dressing into the kale. Add the squash and candied walnuts. Right before serving, slice the apples and add them along with dressing. Serve immediately.